Foolish me, I should've known better. Making a scrambled egg sandwich with cheese just before work and expecting to have time to eat it once I got in was way too optimistic. I should have known that. I had the sandwich placed on top of the container of borwn rice fresh out of the cooker to keep it warm on the way. I was thinking about a coconut water to go with it. Then, then I walked into the office, and got ambushed by no less that three people asking me to do things. I was running around, going up and down the stair for three and a half hours straight. And when it finally slowed down enough for me to even think about that egg sandwich, it was cold. 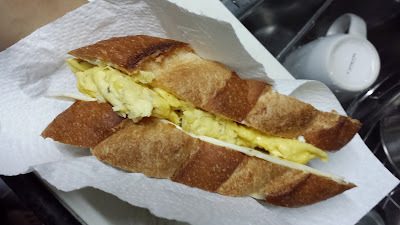 My egg sandwich, when it was fresh and warm, and probably delicious. It was still good, but I couldn't help but think that it would have been delicious if it was warm. Oh well, a mistake that I wouldn't soon make again. I had another milk tea with it, because I couldn't be bothered to go out for the coconut water. I did eventually have coconut water, actually, the box is sitting at my elbow as I type this but it isn't the same. Since I have a very late breakfast (early lunch?) I am pushing what I was originally going to have for lunch to tomorrow. I'll probably have my Parmesan cheese and lemon juice dressed broccoli later and call it good. Work, not conducive to good eats.